Yes Please restaurant at the newly opened Couples Resorts serves a mouthwatering menu that shows off some traditional Caribbean cooking. The Caribbean island of Barbados is often described as an island that’s sophisticated yet casual, warm and friendly, with a distinct charm that visitors can glimpse from the sun, sea, sand and Barbadian islanders themselves. Barbados is also considered to be a luxurious yet intimate setting for a romantic time away balancing the luxurious with the affordable. Anyone can go to Barbados and have a truly wonderful Caribbean holiday. Couples Resorts acquired the Almond Casuarina hotel in Barbados in June 2013. With four successfully run resorts located in Jamaica the company decided to open their fifth resort on the beautiful island of Barbados. Couples Barbados is located along the south coast in the very popular resort and residential area of Dover on Maxwell Beach. The property is within walking distance of the lively St Lawrence Gap, an area well known for its night-time entertainment and party atmosphere. As the only resort on the island devoted exclusively to couples, this Couples all-inclusive resort provides a tranquil location designed for complete relaxation and romance. Bajan cuisine is influenced by its rich cultural history. It’s a unique fusion of foods from around the world with African, Indian and British influences. The national dish is cou cou – a mixture of cornmeal and okra – with flying fish. It’s a must try dish for guests and one that can be sampled at the Couples Barbados restaurant, Yes Please. The Corporate Chef acros the resorts, Stefan Spath, has ensured that these items and other popular fish found in the surrounding waters are included in the menu concept of the restaurant as well so guests can sample some truly authentic Bajan flavours. From tasty appetizers and salads and Bajan inspired soups to delectable entrees and mouth-watering desserts. Other very popular dishes to sample include fried fish cakes, fish and chips and macaroni pie. Sweet desserts such as tamarind balls and baked custard have also been included. Yes Please restaurant is open for lunch and dinner daily, except on Tuesdays, and features a Caribbean cuisine with a twist. With an array of deliciously flavorsome dishes to choose from, the menu is rotated several times per week and is a hit with guests. You’re dining experience will be one to enjoy in a colourful Caribbean atmosphere. 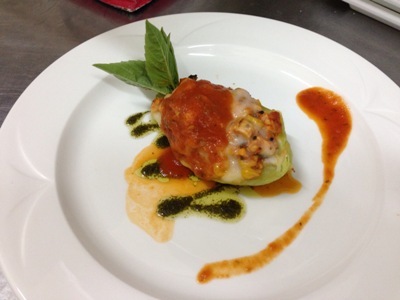 Stuffed Christophene with chicken, bell peppers, onion and roasted corn, baked in a light tomato sauce with mozzarella cheese. 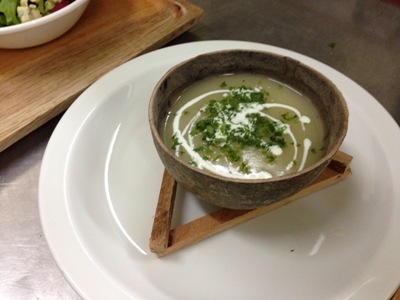 Bajan inspired Soup of the Night.